I need a better violin. How to get it? The cheapest and best option...? I need a better violin. It shall be a master violin, but I don't have enough money to buy an old instrument. If I sell my actual violin very well, I can get about 650 $. So I will not be able to spend more than 1000$ for it. I don't want any kind of factory violin. Even if it adjusted Yogi Bear himself. NO. As we are a country of violin makers, I'm thinking about finding a less famous but skilful violin maker who creates a new one for me. But is it a good idea? How can I recognize in the "birth" of a violin that it is going to have a good sound? There is another option - to buy an instrument from another violinist or a guy who found something in his granny's garret. (No guarantee, of course.) But I'm afraid I can't recover any hidden faults or estimate the real value of the instrument. So I don't know what to do. I cannot expect I would have a higher income in following years. I chose a bad profession. "...finding a less famous but skilful violin maker who creates a new one for me." Are you obligated to buy one if he makes it and it has a bad sound? Add to that idea - references!! Would it be possible to hire a violin maker AFTER hearing and seeing violins he has already made. He might have a list of people who have purchased his violins and who would be willing to play them for you. How exciting!! A violin made just for you!! Thank you for your reply, Schaick. I'm afraid it's really impossible to evaluate the sound of a fresh violin. I'm sure you must pay a part of the price before he starts making your violin. (For the wood) But I don't know what happens if you don't like the result. Yes, it is exciting! And here it is more than ordinary to order an instrument made for you - especially in guitars. But the most expensive element is fame (or you may call it reference). I have asked a less known violin maker who won some competitions with his violins and he offered me a violin for 125000 CZK, which is 6250$!!!!! This represents my 7 month wage!!! (now when I am on maternity leave, it is my 14 months income - absolutely impossible. Congratulations!! - boy or girl? Oh My Goodness!! $6250!! There is no way I could afford that. I was concerned about getting the violin that was given to me fixed. Same thing with my violin but a lot less money, but I was still worried. What if after getting it fixed it had a horrible sound and only worth $300 or even less!? One luthier said $300 for the repairs second luthier said around $150. The second luthier ended up charging just $115. Turns out my violin is worth $500-600. I am new at this, have only played since the end of May. Hope @Fiddlerman sees this post maybe he can help you figure it out. Thanks! It's a boy. Once I said: If I had a baby boy, I would name him after maestro Josef Suk. 10 days after I conceived my little Josef. Miracle. What you wrote about your violin is the core of the problem. I hope Fiddlerman helps me. So far no reply from him, he might bee too busy. Sorry Terezka, did I miss a message from you? Your plans sounds good to me. Hope you can find the new maker that would charge so little for a quality hand-built built violin. One never knows really. Congrats on the coming of Josef!!! Buying a violin sounds cool..to have it made and all that. Sounds like your mind is made up and that is what you do in your part of the world... very exciting. I am just happy that Pierre has picked some of the nicest violins and offers them and backs them and they are so affordable. I have a new Soloist violin. I fell in love with it from hearing a member playing it here on the forum... then Fiddlerman's demo...then two more members. I didn't know if I would get one with that same voice... but I kept hearing what I wanted to hear in the violin from different players with different skills. The sound I heard was something that reminded me of my violin friend and mentors violin, hers is about 100 years old and sweet as can be. From the moment I got mine and played it... I heard that voice... three weeks later that voice is even better.. I am sure I have logged in 22-25 hours of play time ..minimum...and I am even more in love. So I am sure in my mind that I have the very best instrument for me at this time and for a long long time. My violin partner has been playing for over 20 years and she got to play it last week..she played it so well...and she is used to her very very fine 100 year old violin. She liked it. (she has been very skeptic about buying a violin on line) She liked how I played it..she is happy that I have an instrument that has me advancing and playing better and the instrument is actually letting some of my very hard work of the last year pay off. 🙂 She called it a NICE UPGRADE! Sorry to go off topic... I haven't raved too much about the Soloist violin on the forum, because I was in shock for a while. I also am a positive person and I wanted people to take me seriously when I say this is a really great violin. I mean I didn't want people to think I am just blowing sunshine.... ...well ... and then I had to learn to play her and get used to her...and well... it is late and I am rambling about my adored violin. I hope your new violin experience will be the same for you! At the end of the day...just make sure you play music! Coolpinkone, wow! I must admit I had to read your reply for three times to understand it fully. It isn't easy to a foreigner. It sounds great, I'm glad you like your factory violin. I cannot buy a violin outside the European union because I'd pay a high duty. Anyway I think it is better to buy a hand made violin. Here it is almost obligatory. Imagine an Italian man in Rome buying his daily spaghetti in McDonald's - that's a nonsense. I think that after 100 years your mentor's violin will have double value, but yours will "make a lovely fire" (do you know this joke of Garfield? Jon says: "Garfield, you make such a lovely fire. ""Yes, I do make a lovely fire. ""Where are all my bow ties? ""They make a lovely fire." ). Of course I wish you to enjoy it and hope they will be good for a long time. 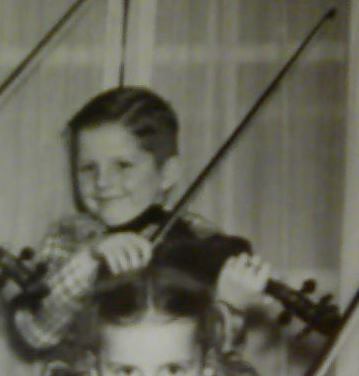 @Fiddlerman Thanks for your reply, I hope I'll find some good violin maker. But how to recognize he is really good? @ terezka: You are looking for a good violin maker. Do you have a violin maker / luthier, that is available to you in your area ? What I would do: Go to him and ask for the name's of a few people he has made violin's for, ( if they are available ) see if you can contact any of them and inquire how well he make's violin's and are they satisfied with his work. Also, a high price is not a guarantee of a good violin, keep that in mind. I hope you find one Terezka but at the price that you are talking about I am also extremely doubtful. It can be possible to find someone who is learning to make one for that price but just the quality materials in itself will cost half that price if not much much more. Secondly, even a learning luthier will be attached to his or her first violin so to speak. The soloist, btw, is not exactly a factory violin. Its hand made in a violin shop with very few workers and supervised by a senior master luthier from start to finish. The GCV's and the Ming Jiang Zhu as well. That being said, I'm not trying to change your mind. You have a great plan and I sincerely wish you luck in finding that special luthier. @ Toni - Thanks so much for being the person you are and for supporting Fiddlershop as well. To me it isn't important whether e.g. the fittings are made of boxwood or ebony. I think there a few more aspects which are not important and only increase the price. But you might be right, we'll see. @Fiddlestix Thank you. It seems I'm going to need a lot of luck. ...if there is no possibility to get a really good violin at this price, I don't know what to do... This violin hinders me unbearably. Btw. I'm shocked by the term "luthier" - no e-dictionary contains this word. I had to find it at wiki. To me it is not a solution. But I like the story of your family and wish to all of you good luck and health. That guy has a total of two posts on our forum and both are the same. Spam for Kennedy violins. Ignore it. I wouldn't recognize it. I'm a trusting baby. Comparing someone's prized possession to McDonalds, and saying it is likely to be firewood....hummmm. A joke perhaps... But I can't say I laughed. I am glad I have no obligations to anyone or my country as far as what I buy, what I play or what I say. For now I am making lovely music on the violin of my choice and my dreams. Well, I'm pretty fond of my fancy handmade piece of firewood too. @terezka - While I'm sure we have a very tiny bit of language barrier here, I just wanted to say something about the part above to Fiddlerman that I put in bold. There are no mistakes about his items, and nothing to correct. Pierre was merely explaining to you that the Soloist, which I also have, and the other violins he mentioned are handmade.They are not factory or assembly line. A couple of years ago, I saw a violin that a Luthier made and had up for sale. He wanted $25,000.00 for it. @Composer I feel sorry you took it in bad part. But what @Feathers says is more than true. There are HUGE cultural differences and as I have no notion of your relationship to McDonald's (patriotism or contempt? ), I only surmise the relationship that have Italian people to their pasta and as well you cannot know what it all means for us. In my country McDonald's is an expletive (sorry, it's true) and a factory violin means the same as manufactory violin and a hundred years manufactory violin has no value. I cannot know whether it is the same in you country, but I cannot change the situation here. @Feathers I'm not sure about the difference of the meanings - anyway I think it's absolutely natural that a shop owner wants his customers to have the right data about his items. My actual violin is a hundred years old and it's only one inch from firewood - it is handmade by a luthier. I think that after 100 years your mentor's violin will have double value, but yours will "make a lovely fire" (do you know this joke of Garfield? Jon says: "Garfield, you make such a lovely fire. ""Yes, I do make a lovely fire. ""Where are all my bow ties? ""They make a lovely fire." ). Of course I wish you to enjoy it and hope they will be good for a long time. @Fiddlerman Thanks for your reply, I hope I'll find some good violin maker. But how to recognize he is really good? I didn't notice this statement before and I see why Coolpinkone reacted. To this statement I disagree completely. Toni's violin will definitely last way more than 100 years and will sound better at that time as well. Age does wonders to violins and hers is a hand made violin made with good quality wood. As long as it isn't involved in an unfortunate accident and well maintained it will live on for many decades. The violin that you hope to find may or may not become valuable in 100 years. In order to find a luthier who will make a violin for under $1000 you will have to find an unknown maker and get pretty lucky for it to be a great violin as well. It takes time and money to make a violin from scratch. What good luthier could afford to make instruments at this price? They can in China because of the economy and competition but even in Poland, Bulgaria, Romania and I guess the Czech Republic as well...where the cost of living and average income is way less, one must charge way more money for this kind of work to make ends meet. Remember that good materials and tools are costly as well. Having said all this, I sincerely hope you find the luthier that you are searching for. Bare in mind that I am definitely not trying to sell you an instrument, just defending what I believe in and would not be in the business if I did not.